Not to mention the fact that Enlightenment first appeared in 1996 — years before OS X. So, if anything, OS X resembles Enlightenment. I guess so, if one squints hard. Enlightenment always has been awesome and has been on top of the eye-candy game before most people began playing. What’s more, they do it without requiring hardware acceleration. E is a serious WM, not like the cheap knockoff known as Metacity. If you think GTK and Metacity themes are UI customization you know nothing, nothing. All of my computers use either E16 or E17; have for years, will do so for as long as I can. Who cares if they do it without hardware accel., by the time enlightenmnet makes it to 1.0 we’ll all be using something like MS Surface and talking to computers Start Trek style. Always on top of the eye candy game? Is this suppose to be great looking: http://www.geocities.com/firsttimelinux/images/elive-grab1.jpg ? What the hell has happened to that top window with all the folder icons? It looks no better than a win-blind theme… with emph. on the blind. The gOS machines were made possible by Enlightenment’s ability to run without hardware acceleration on less powerful computers. Always on top of the eye candy game? Is this suppose to be great looking: http://www.geocities.com/firsttimelinux/images/elive-grab1.jpg … It looks no better than a win-blind theme… with emph. on the blind. Another funny joke, but the theme determines the look. There are a lot of Enlightenment themes, and they are highly configurable. Obviously, the Enlightenment theme on gOS has mass appeal. You realize that hardware acceleration is precisely what you want on a less powerful computer? Enlightenment was chosen to differentiate the system, it had nothing to do with resource utilization. By the time all of the GTK libraries and related pieces are loaded for the desktop apps, it becomes an academic argument. It originated at a time when powerful graphics adapters were a luxury, but that time is gone. Desktop bling doesn’t require a dual-core graphics card, even the cheapest and most anemic graphics hardware can outrun most of the highend stuff from several years back. And certainly on the Walmart systems. It’s a solution to a problem that doesn’t exist any more. Don’t get me wrong, I can appreciate the amount of engineering work that went into creating such a resource efficient framework, and I can see where it may be an advantage to older and lower-powered systems, but I don’t buy the resource efficiency argument when it comes to modern hardware, even the cheapest and lowest-priced variety. I had compiz and beryl running fine on my old 6-year old Dell laptop with a ancient GeForce2/32MB card. Didn’t do all the fancy effects, but the compositing worked and I had my wobbly windows, and it didn’t spike my CPU. It would be interesting to see the attention-to-detail that went into E17 applied to a composited desktop, to see how well the approach would work for bringing modern desktop goodies to lower powered machines. Would probably humble the compiz/fusion crowd, and still run well on a $299 Walmart machine. You realize that hardware acceleration is precisely what you want on ANY computer? Enlightenment was chosen to differentiate the system, it had nothing to do with resource utilization. Really? The graphics processor for the VTC2502 is an “on-board” VIA UniChrome Pro that uses 64Mb integrated memory. With such a weak set-up, they probably would want to keep desktop bloat to a minimum. One would think that KDE/Gnome would slow it down considerably. If your assertion is correct that gOS/Everex chose Enlightenment merely to “differentiate the system,” then you have the inside scoop over desktoplinux.com and wired.com! Congratulations!! Who cares if they do it without hardware accel. It means the code is efficient and does not rely on overpowered hardware to hide its flaws. If this confuses you I will summarize: It’s good. , by the time enlightenmnet makes it to 1.0 we’ll all be using something like MS Surface and talking to computers Start Trek style. This 1.0 fetish of yours only reveals your ignorance. Remember when Linux hit 1.0? No? Exactly. Version 1.0 is just the version after 0.9, nothing special. For Enlightenment version 0.16.x has been the stable branch for most of a decade. Version 0.17 is just the next major version; it will never approach 1.0 unless the developers bow to the popular delusion that 1.0 means something is done (which hopefully will not happen). In all probability you wont even see 0.18 until a major architectural change takes place. You’re objecting to the look of the evidence file manager? That has little to do with Enlightenment; despite the topic my comment was not in reference to elive. What you should take away from Evidence is the mutability of the environment. It is not meant to be a usability reference app. ..Definitely rocks. I’m using it on my personal laptop. Coupled with ROX-filer and it brings relatively light yet eye-pleasing environment. And yes, the above poster is correct, E17 does not give you the look and feel of OSX. The ‘dock’ in E17 functions differently from that of OSX. As for the article it is kind of anemic, but a good introduction nonetheless. I tried to get a look at it back some time ago. I just wanted to see what I thought about it. But, due to the unorthodox ‘paypal before you thing’, I never got it installed. I clicked back and forth between the pages on the website and kept thinking, “I must be overlooking the link. Damn. They make it hard to try.” After reading this article, I guess I wasn’t overlooking it, afterall. It looks like an interesting project. But, I just can’t get over this ‘pay just to look at it’ mentality. Yes. I know about Elive. But, for some reason, it didn’t work for me at the time. I can’t recall what the issue was. But, I was left with paying to see it, or not seeing it. I chose not to see it. I think if this developer wants people to get interested in it, he needs to make it easier for the casual user. It might not directly benefit him financially, but hopefully it would pay dividends later as a result of the increase in awareness. And, why is it just one developer? Personally, I’m just not going to pay to see Enlightment when I have full featured WM’s to choose from. I guess I could try Elive again. Maybe I will. There is a link to the slow download, I believe. If not, all they want is a donation of any amount. Would it kill you to donate $5 to download? Just to be clear, Elive isn’t made by the E17 devs – they’ve never asked for money to let you download Enlightenment. I guess it’s actually a commercial Linux distribution. I’m sorry but I’m just not going to pay for an obscure Linux distribution. Personally, I’m just not going to pay to see Enlightment when I have full featured WM’s to choose from. … and there is definitely no need to do so. Nobody has ever charged me for “apt-get install enlightenment”. When I hear beauty I expect to see it. The article did not provide any screenshots of such beauty. Why do they even call it eye candy? Isn’t it supposed to appeal the eye? Ugly if that single screen shot is anything to go by. Yuk! In fact, it -is- like osx if you use the E16 desktop. It as a dock (engage) and osx like wm. E17 is nice to, but feel less like osx. I really like elive, it is the first live-cd i will try on a computer to see if everything work or to backup a dieing windows install. I also like the software choice. It is the only distribution that include cinelerra and the right codec pack to prevent it from crashing every 2 minute. In fact, it -is- like osx if you use the E16 desktop. It as a dock (engage) and osx like wm. 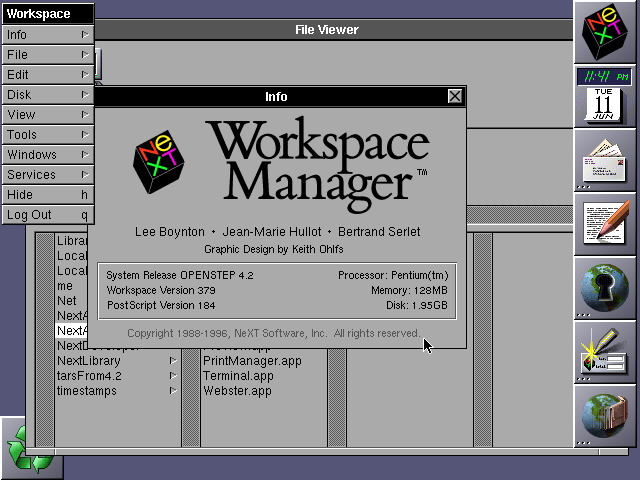 Enlightenment was around years before OS X, so, if the two UIs seem similar, OS X resembles Enlightenment. But OS X was meant to resemble NEXTSTEP! Not sure that OS X was meant to resemble Nextstep, but even so, Enlightenment was not derived from Nexstep nor OS X. For one thing, Elive has always been a live CD, but you could also always install it on your hard drive. That is not a new feature of version 1.0. Maybe the mechanism has changed, but you’ve always been able to install it on your hard drive. Give me a break. All this review is missing was the free set of steak knives. More of an ad than a review. Hope the author got a freebie. I’m sorry, but that screenshot looks so dated, it’s scary. I remember a buddy of mine messing around with enlightenment 7 or 8 years ago and to my eyes, it doesn’t look a great deal different. Personally, I think it’s disjointed and ugly and a case of eye-candy overkill. Beauty is certainly in the eye of the beholder, but a GUI’s look is largely determined by the theme, and Enlightenment has a lot of them. And if you don’t like any of the zillions of Enlightenment themes, you can create your own. Enlightenment is thoroughly configurable. By the way, there are countless other *nix window managers and plenty of those have countless themes and are more or less configurable, too. Ease of use? A lot must have changed since then. When I last tried it it was beautiful yet hardly usable. What usability problems did you encounter? Enlightenment is just as usable as any other GUI. I played with E for a while, and it’s pretty impressively responsive, and fast loading. The only problem I have with it, is that by default, the theme tends to be ugly – and that includes the linked distro. I’m saying that’s a permanent problem by any means, it’s just a them for a very customizable window manager. If they want to impress anyone, they are going to need to get some real high end design intervention. That’s the same problem KDE has in my opinion. It’s impressive, but the rough edges are just too hard to look past (KDE in particular is always far too cluttered looking IMO – despite the impressive eye candy). The default theme is chosen or created by the distro. As you may recall, gOS was the operating system used on the Everex machines that sold-out at Walmart within two weeks. So, they must be doing something right with their theme.